In his groundbreaking study of science fiction, New Maps of Hell, Kingsley Amis devoted much of his attention and praise to what he called the ‘comic inferno’, and in particular to The Space Merchants by C.M. Kornbluth and Frederik Pohl, who sadly died just the other day. So this time around I’ve picked a book that references the Pohl and Kornbluth classic, even if it doesn’t come close to matching it. This review of Jennifer Government by Max Barry first appeared in Foundation 90, Spring 2004. In The Shield of Achilles, his monumental study of the relationship between strategy, international law and the nature of the state, Philip Bobbitt proposes that the current nation state is already giving way to a new form: the market state. Those of us familiar with science fiction do not find Bobbitt’s idea at all radical or surprising, we’ve been familiar with the idea of the market state at least since Frederik Pohl and C.M. Kornbluth’s The Space Merchants first appeared as long ago as 1952. The Space Merchants is name-checked in the latest example of market state sf, Jennifer Government: “It was turning into a sly, anti-free market statement, and irony irritated him. There was no place for irony in marketing, it made people look for deeper meaning.” Thus the villain of the piece, John Nike, muses as he disposes of the book during a trans-Pacific flight. Jennifer Government is, of course, a deeply ironic book, and there is nothing sly about the anti-free market statement that is writ large throughout this satirical farce, or farcical satire. Whether there is, indeed, a deeper meaning to be sought behind the comedy – other than the blatant message that Bobbitt’s cautious welcome of the intrusion of free market economics into the shaping of international relationships is plainly wrong – is, however, moot. The first and perhaps best thing to be said about this novel is that Barry sets up a superbly intricate plot, and maintains it with logical rigour. This is necessary in any farce: there has to be an irresistible reason why the vicar is hiding in a cupboard without his trousers or else the whole farrago collapses into silliness. Barry starts with a piece of nastiness that seems perfectly in keeping with the amorality of his world in which the demands of business take precedence over all else. John Nike and his colleague, John Nike (nothing so succinctly and successfully indicates the nature of this world more than the fact that people take the name of the company they work for) recruit a poor schmuck from merchandising, Hack Nike, to carry out their latest guerrilla marketing brainwave. On the day that the latest range of Nike trainers is launched, Hack is to kill some of the first customers. The idea is that this will make the trainers seem even more precious, and therefore inflate demand. (There is nothing new about guerrilla marketing, only about the extremes to which Barry extends the idea.) Hack, however, is still so low in the business hierarchy that he has a conscience. He is delighted at the opportunity to move up the greasy pole (he doesn’t realise that to John and John he is a sacrificial instrument), but killing is taking things a little too far. So he reports it to the police. Unfortunately, the police also have to make a profit. They interpret Hack’s approach as a commission; in fact they pass the commission on to a third party, the National Rifle Association. So when Buy Mitsui, a not very successful corporate trader, goes to the local shopping mall after a hard day, he is just in time to witness a young girl getting gunned down at the entrance to the Nike store. Meanwhile Billy Bechtel is made redundant from his tank-building job outside Abilene and decides to take a skiing holiday, but for some reason his travel agent sends him to New Zealand, where he is mistaken by the NRA for the hero of their latest hit. Like any farce, therefore, the story progresses by misunderstanding, coincidence and misidentification, and these traditional elements put the various pieces in place for a story that then proceeds at such a fast rate there is no time to notice that it is, actually, farcical. From this point on catastrophe is piled upon horror is piled upon villainy until it seems that the whole world is to be torn apart by corporate greed. Most of the big players are uniting into two rival alliances, not unlike the European alliances that set the scene for the Great War, but in this instance the alliances are built around customer loyalty schemes (Nectar loyalty points, anyone?). As with global politics so with corporate politics: the alliances grow and with them grows the rivalry until outright war is the inevitable result. John Nike’s callous ploy has brought him to the attention of the corporate movers and shapers and he climbs rapidly until he finds himself the evil strategic mind behind the bigger of the two alliances. He steers the world into war with unholy glee, but he counts without his nemesis, Jennifer Government, now an ill-paid agent of the virtually impotent Australian government where the Nike shooting happened, but once a highly paid colleague of John Nike and his lover. 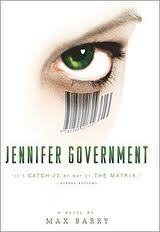 Jennifer Government is the quiet voice of conscience at the heart of this immoral farrago. Through the small players in John Nike’s plan, Hack and Buy and Billy, she slowly unravels the plot until she is able to engineer a counter-coup and face John for her long-planned revenge. It’s a bloody book – and awful lot of people are killed, or are attacked savagely – but there is little sign of pain or compassion. Every act of violence is presented as part of a slick, morally-neutral play. Given that, it feels uncomfortable to admit that it is also a very funny book. It is a good long time since I read a science fiction novel that made me laugh out loud as consistently as this book did. Of course it is a farce, we are meant to laugh at the rapid entrances and exits, at the ridiculous meetings and deceptions, at the close calls which work out okay at the last minute because of the most outrageous coincidence. But does the satire work as well as the farce? How much of a warning are we meant to take from this vision of a corporate future gone wild if we are also meant to see it as ludicrous? Surprisingly, it works well, Barry has achieved the neat balancing act of making a world scary while making his story comic, this is a novel we want to laugh at from the safe distance of not going anywhere near it. It is not a new Space Merchants; his reference to the Pohl and Kornbluth novel indicates that Barry is, indeed, aware of his antecedents, but he has chosen a more knockabout and hence less subtle approach. If there is plenty of irony in the novel there isn’t much deeper meaning; all that is there is on the surface. We laugh because we can see the foibles of the modern business world, in which all of us to some degree arte caught up, writ large, like a Dilbert cartoon with added viscera. But if it shocks it is because of the excess, not because of what it tells us. If it has an effect it is because of the breadth of the farce, not because of the depth of the analysis. There is, in the end, a sense that Barry is trying to have it both ways, an anti-globalisation riot as presented by a slick marketing professional.